One of my most anticipated films for SXSW was Born to be Blue, a “biopic” on legendary jazz legend Chet Baker. I had heard from the world premiere at Toronto last fall that the movie was very well done, and that Ethan Hawke gave arguably the best performance of his career as Baker. This was very tempting to see due to this high praise, and also because Hawke has been doing some of the best work of his career lately. (Before Midnight, Boyhood, etc). Born to be Blue is not an accurate biopic of Baker’s life by any means, but it’s also one of the best music biopics I’ve seen in recent memory. Here’s my review of Born to be Blue. As mentioned before, Hawke plays Baker in the late 60s period of his life, where he’s trying to get clean from his addiction to morphine and heroin. He’s starring in a film about his life, and meets/falls in love with an actress whose playing his wife in this movie (Carmen Ejogo). After that, Baker gets his teeth punched in due to him owing them money for drugs, and he loses his ability to play the trumpet due to his false teeth that he has glued into his jaw. Slowly but surely Chet is able to make a comeback adjusting to his set of teeth, but as we all know the story of Baker, it’s not a happy one. Canadian filmmaker Robert Budreau writes and directs this film, a few years after he wrote and directed a short film about Chet Baker (which starred Stephen McHattie, who plays Baker’s father in this feature). What’s interesting about Budreau’s take on Baker’s life is that you never see him as a kid. The “flashbacks” in the film are clips shot from an aborted movie about Baker’s life. When we see “flashbacks” of Baker and his ex-wife, its Carmen Ejogo playing the actress playing his wife (it’s a little confusing, but it’ll all make sense when you see the film in a few weeks). It’s not your average biopic, and not just because a lot of the film is fictionalized. This unorthodox approach to the film really works for the film, and it makes the film more engaging and interesting for this reason. But the real reason why this film works as well as it does is because of the magnificent performance by Ethan Hawke as Baker. Hell, it was so good that the entire theater gave Hawke a standing ovation when he got up on stage after the film. I’ve always enjoyed Hawke as an actor and he rarely ever disappoints with his performances, but this was the first performance I’ve seen by him that was jaw-dropping by how good it was. 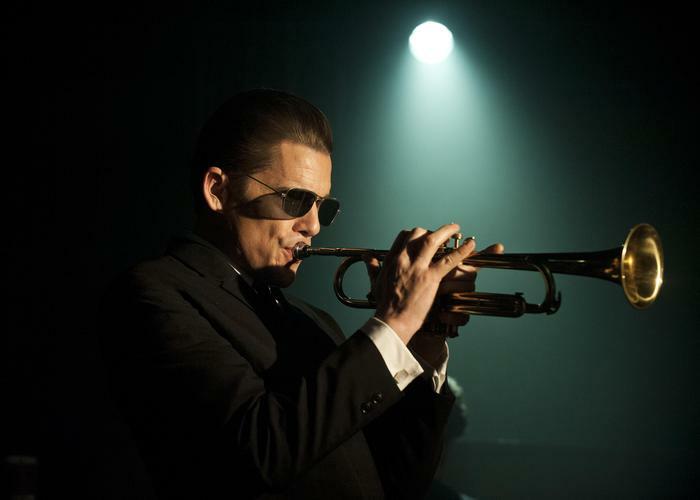 The actor completely disappeared into the film, and I forgot at times that I was watching Ethan Hawke the actor playing Chet Baker, but watching Chet Baker play Chet Baker. It was really spectacular. Another plus for the film is that it’s relatively short. It’s a little under 100 minutes, which is refreshing since a lot of these music biopics get a little bloated with their running times. As much as I loved Straight Outta Compton, the runtime felt a bit too long at times. This was the perfect length, never felt like it was dragging along or that we were breezing through anything. And it’s for that reason that Born to be Blue is another great highlight from this year’s festival. If you had one incentive to see the film it would be for Hawke’s magnificent performance. The film opens in limited release on March 25th, so do me a favor and go see the film if you can (and not just because it’s released on my birthday…).